NOTES: Limited run with resin and etched metal parts. The Fiat CR.42 was the last fighter biplane to be manufactured during WWII. Entering service in 1939, it was praised for its maneuverability and ease of flying. However, it was sorely lacking in speed, armament and pilot protection. It was a case of not realizing that the end of an era was near. 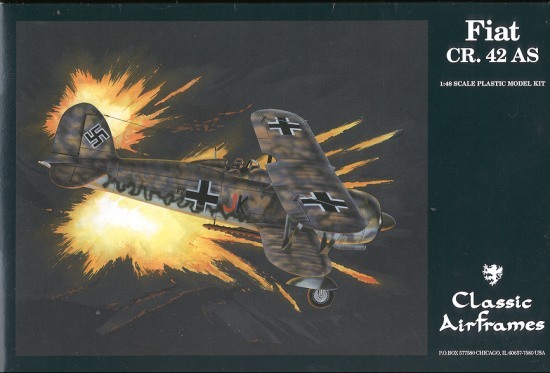 The CR.32 was probably one of the best fighters of the Spanish Civil War, only really being bested by the Bf-109. This led to the conclusion that there was still a place for a biplane fighter. That conclusion was wrong. CR.42s were badly mauled by Allied monoplane fighters, and it was only when in combat with other biplanes, such as the Gloster Gladiator, that the CR.42 was able to do well. Despite its lack of speed and firepower, it was a ruggedly built aircraft and was perfect for those areas were there was little Allied air opposition. When it was obvious that it wasn't going to be effective as a fighter, it was turned into a fighter bomber and used as an interim night fighter. The CR. 42 was somewhat successful in the export market as well with examples going to Belgium, Hungary and Sweden. This is the second go-around for the CA CR.42. The previous kit was done very early in Classic Airframe's history and though while it was welcomed, it was also somewhat lambasted for having some dimensional errors. Not having built that previous kit, nor having one available, I cannot say what those errors are. I do know that this is an entirely new mold kit and while based on the older one, whatever glitches were with the other have been corrected. 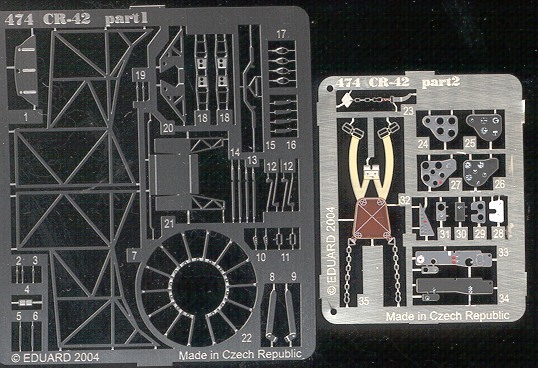 The kit is very much what one expects from a modern Classic Airframes kit. There are two sprues of well detailed injected plastic, two photo etched frets from Eduard, and two bags of very nicely done resin parts. Also included is an injection molded windscreen. The interior is made up of a resin floor with etched metal framework and detail parts in both pe and resin. Very much in the manner of the Mirage PZLs. A very nice touch is a photograph of the completed, but yet unpainted interior. This allows you to see where the interior fits and what it should look like when it is all together. A nice surprise is that one of the Eduard P.E. frets is in color! The resin is well done and one of the bags is basically a resin engine with separate crankcase and cylinders. It is almost a shame that it has to be covered with the engine cowling. For options, you can add bomb racks and bombs, use short or longer exhaust, have an optional carb intake, and have options in terms of having wheel pants or not. The instructions are quite well done with addendum drawings for this particular boxing included with the standard instructions. Color information is provided in generic names and listed throughout the construction phases. 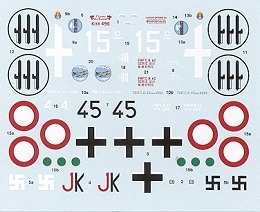 Markings are provided for four aircraft. One is the box art aircraft operated by the Luftwaffe over Turin in 1944, another is what seems to be a post war aircraft from 1945/46, and the other two are standard Regia Aeronautica aircraft from the 1942 time period. A note states that color images of these planes are available at the Classic Airframes website. Decals are superbly printed by Microscale so you know that you'll be getting the best. I'm sure that this kit will be well received. Their earlier boxings were all very good sellers and with the additional detail added into this one, it makes it just that much more desirable. Review kit courtesy of Thanks for your support.